This is a great process to start in the fall and winter to have fresh citrus flavor on hand through early spring until in-season citrus comes back around. Also excellent for gifting! The lemon rind, in moderation, is great for salads, dressings, sauces, soup garnishes, gremolata, quinoa or couscous, piccata, cocktails, baked goods, pasta dishes, or anything that needs a little kick of acidity. We've used it in our Tuna Poke. Makes about 2 quarts or 4 pints. Quarter the lemons long ways without cutting through completely on one side. Combine the salt and sugar with Coriander and Cumin Extracts and Meyer Lemon Compound. It will resemble wet sand when thoroughly combined. Pack the lemons with your salt mixture and put them into the jars. Squeeze them in there to release some juice. Give them a shake so the lemon juice can reach the top of the jar and fall back down. Evenly distribute the spices and bay leaves, tearing in half if using 4 pint jars. 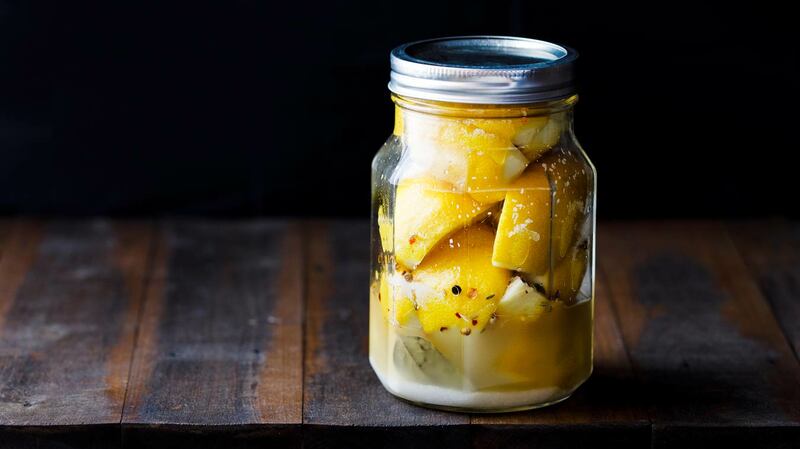 Leave jars out overnight at room temperature. Refrigerate the next day and flip the jars upside down every so often for a few days, then flip them right-side up again. After at least 3 weeks, the volume should go down significantly. At this point, consolidating the jars is an option. Just make sure all the liquid from one jar makes it into the other! The zest is ready to use at this point and will only get more flavorful with time. Rinse a piece of lemon and lay on a cutting board, skin side down. Turn your knife horizontally and cut the pith off the skin. Discard the inner part of the lemon. 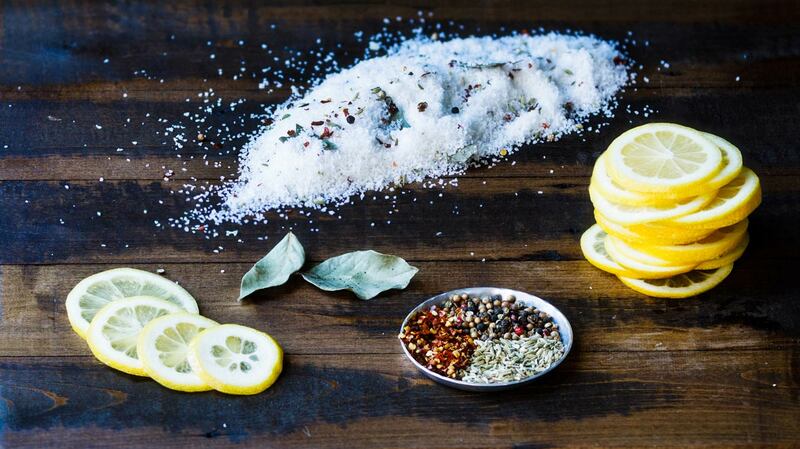 Finely dice peel to add pops of flavor to whatever you are making.